Frequently after reading a book I am left with what I have come to think of as mental images, particular sentences that linger and freely associate with other thoughts. They hang around a while as vestiges of language, haunting echoes. Only, they aren’t really images. Not quite pictures, more shadowy impressions, phantoms of text that play incessantly on my mind for days, sometimes weeks. Your soul is peeping out of your body as though a work lay there inside you like a slumbering goddess, wanting to get out, even in her sleep. That’s how it seems to me at least. Things that peep forth often annoy people who want to be forthright themselves. This soul, then, has a nice stretch inside you, as though what it wanted was to become language but then never have anything to do with itself again. In this text, Jelinek’s voice is interwoven with Robert Walser’s voice. The question Who speaks? is implicit throughout. We know that Walser spent the last thirty years of his life in a mental hospital. During that time he wrote almost nothing. Though suffering from depression Walser acted normally. When pressed by a visitor about whether he was writing he responded, ‘I’m not here to write, I’m here to be mad.’ It is tempting to romanticise Walser and his illness, to imagine that under that melancholy, misdiagnosed as schizophrenia, lay a definitive work, more wonderful even than the masterpieces Walser left. It is what I see in the sentences above. 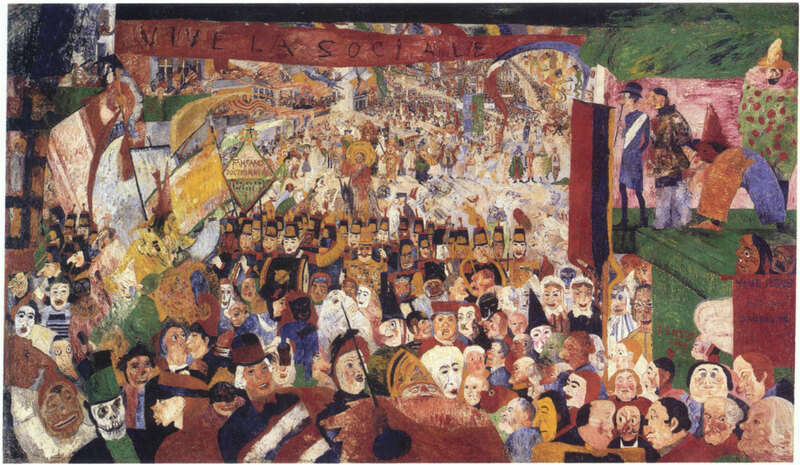 During those thirty years what does Walser think? What thoughts failed to be recorded, turned into language, converted into another masterpiece? Or where there no thoughts, just the dullness of depression interspersed with cocktails of drugs? For reasons I can’t really explain there’s a fusing of Ludwig Wittgenstein and Robert Walser in my mind. I’m unable to think of one without the other. I suppose they were contemporaries and both shared a passion, even obsession, with the way that language can be used to show, or obscure, the world. That aside, their paths could not be more different. Walser’s journey ended in a mental hospital, unable, or unwilling to write. It is from this point that Her Not All Her loosely resuscitates Robert Walser. Elfriede Jelinek, in a beautiful Cahiers Series publication, uses Walser’s voice as the starting point for a prose-poem about language, memory and artistic creation. I’ve read it twice and am very taken with the beauty of Jelinek’s prose (as translated by Damon Searls). It is written to be performed on stage and not intended as a short story, a performance I’d love to see one day. Alongside the prose are a series of reproductions of Thomas Newbolt’s ‘Head’ paintings. Newbolt’s work is new to me, but I am as stunned by his powerful paintings as by Jelinek’s prose. This is a cryptic work that I am nowhere near the end of unpicking and contemplating. If you have read this edition, I’d love to have a conversation to see what you make of it. My version of Walser’s Response to a Request is the first story in Serpent’s Tail edition of The Walk collection. 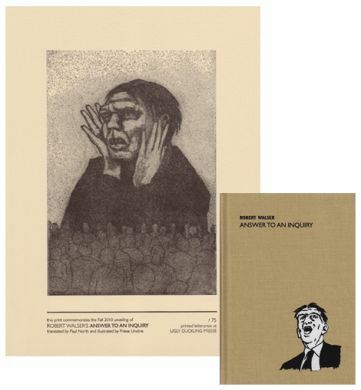 The picture above shows the more recent Paul North translation titled Answer to an Inquiry which comes in a numbered and signed edition, with a limited edition letterpress print from Friese Undine’s Walser series.